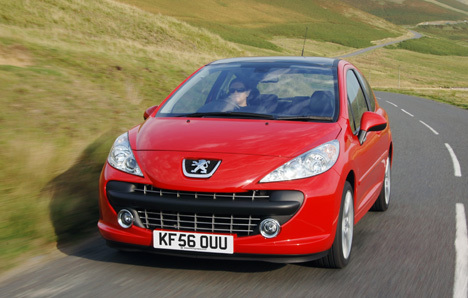 THERE is a danger that the clunkily-named Peugeot 207 GT THP 150 will soon become overlooked. Why? Because in two months’ time its place at the top of the 207 tree will be taken by the GTi THP 175 – a proper hot-hatch GTI to challenge the likes of the Clio Renaultsport 197 and Vauxhall Corsa VXR. But for now the THP (turbo high pressure) 150 is the hottest 207 on offer, delivering as its name suggests 150bhp from a turbocharged 1.6-litre engine which also finds a home under the bonnet of the MINI Cooper. Despite the 207 having grown in size and weight over the 206 it replaces, 150bhp is still enough to make the GT a fun drive. It’s not blisteringly quick but the engine is willing enough to rev round to the red line and the ride and handling are on the firm side to make it feel like a sporty car. Unfortunately, the gearbox and steering don’t benefit from this ‘sporting-up’. The steering is too light and over-assisted at all speeds while the gearbox has that vague action which is common to all Peugeots. And while on the subject of the gearbox, this car is crying out for an extra ratio. At motorway speeds the car revs too highly, making it hard work on longer trips. This also impacts on fuel economy and Peugeot’s claimed average of 40.3mpg will be very hard to match. But away from the motorway the 207 is fun to drive, with enough power and chassis balance to make it good fun. Another plus point for the 207 is the amount of room inside. At the model’s launch Peugeot confidently declared that this car was big enough to entice drivers from the lower-medium sector. Having run a 207 on long-term test we can certainly back up that claim. There is enough room for four adults to sit comfortably inside and a boot that can handle their luggage. But space alone is not enough to tempt downsizers and the fact that the 207 in GT trim looks chunky and sporty will help, too. The GT model has a different front-end treatment to lesser models, with a more pronounced chin and slightly deeper bonnet. To further differentiate the GT, it also features a small spoiler on top of the tailgate and smart-looking 17-inch multi-spoke alloy wheels. There’s also a full-length glass roof that floods the interior with sunlight and bolstered sports seats inside to continue the sporting theme. Standard equipment is high, with air-conditioning, chrome-rimmed dials, an aluminium-effect gearknob and a CD/MP3 stereo system. As an all-round package, the 207 GT THP 150 ticks most boxes – value, comfort and looks. If only the steering and gearbox had received more attention, then it might not become so easily overlooked. A WIDE price range, with the cars united by being sporty-looking hatches with 150bhp. The Ford, Peugeot and SEAT ride on 17-inch alloys and the Mitsubishi 16s, while the Fiesta and Colt boast full-leather interiors. The 207 has part-leather trim and the Ibiza cloth seats. WITH the lowest front-end price and fewest CO2 emissions, the Mitsubishi is the cheapest here. It will cost a 22% taxpayer £45 a month in benefit-in-kind tax. The Peugeot and SEAT are next up, both costing £52 a month. The Ford is the most expensive at £54 a month. AROUND £700 separates top from bottom here, with the Peugeot leading the way thanks to lower garage rates than the others. The exact opposite is true of the SEAT, which has much higher garage bills. The Colt’s smaller wheels mean the lowest tyre replacement costs. WITH 150bhp and sporting pretensions, none of these cars are going to be hugely frugal. The Mitsubishi is the most economical, thanks to its 1.5-litre turbo engine returning a claimed 41.5mpg. The Peugeot returns 40.3mpg, the Ford 38.2 and the SEAT 35.8. DESPITE being one of the oldest cars in the class, the Fiesta leads the way in residual value terms, with CAP estimating it will retain 39% of its cost new after three years/60,000 miles. However, the SEAT’s low front-end price and 36% RV ensure it loses the least cash over the same period. ALTHOUGH the Fiesta doesn’t win any of the running costs sections, its all-round performance is good enough to sneak a narrow victory from the SEAT. Both will cost a fleet around £16,700 to run over three years and 60,000 miles. The 207’s low SMR costs see it secure third. THE Fiesta is the cheapest car for a fleet to run, but it doesn’t win here – that honour falls to the Peugeot. Why? It is fun to drive, well-equipped, is much more spacious inside than the others and only costs around £400 more in wholelife costs than the Ford. The 207 is one of the new breed of superminis that have enough space to tempt people into downsizing from the sector above. Factor in sporty looks, a quality interior and competitive benefit-in-kind tax bill and it is the all-round choice.